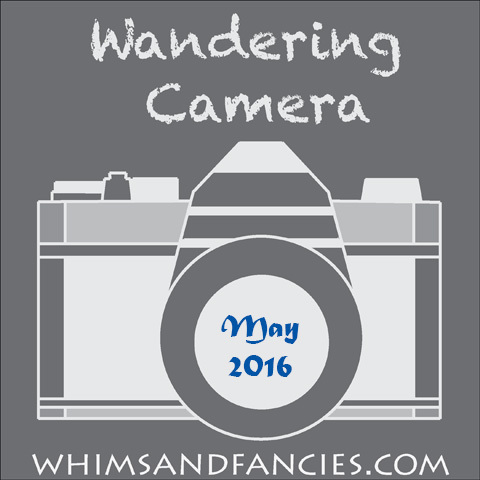 Welcome to the month of May Wandering Camera linky party. 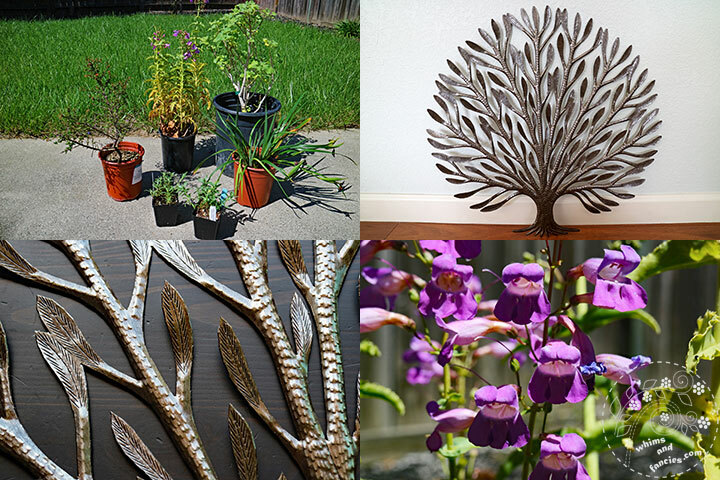 Thank you so much for linking up and sharing your photos. Not only is it a lot of fun seeing the photos, I really enjoy reading about them too. April was such a busy month for me that toward the end I was ready to sleep in for 20+ hours straight if I could. My allergies have gotten much worse too and unfortunately, they are going to stay that way until the end of summer. However, there are pockets of time when the allergy is not as bad and I can go outside armed with medication. I will take limited time outside over none-at-all any day. So far I have kept up with taking one photo per day. Currently I am at 121 out of 366. 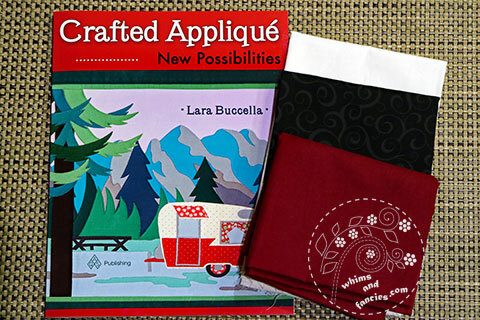 I want to very quickly mention Lara’s book – Crafted Appliqué. You can find the full schedule of the book tour blog hop at her website Buzzin’ Bumble. My day is the 14th of May. I have all the supplies to work on my project and I am super excited to try out her method of appliqué. Now, on to talking about Aperture. A well-exposed (well-lit) photo is supported by three pillars – ISO, Aperture and Shutter Speed. I covered the topic of ISO in March. Aperture is the F number – a number on your camera prefixed by the letter F.
I will omit the technical details on aperture and try to explain the basic goals of aperture settings. You will need a camera with either M (Completely Manual) or AV (Aperture Value Priority) mode to set the Aperture Value manually. In M mode you can set both Aperture and Shutter speed yourself. On AV mode you only get to set the Aperture. Based on your setting, the camera sets the Shutter Speed to get a well-exposed photo. I suggest playing with both settings. Aperture determines the amount of light entering your camera. A lower number equals more light and that lets you use a faster shutter speed. So in really low-light situations you can set your aperture to a lower number to get a higher shutter speed. That way you can take photos without a stand or photograph a moving subject in low light. Aperture also determines the area of sharpness of your photo. Think of looking at the centre of a photo. The lower the aperture number, the less area around the centre will be in focus. If you want to focus on a face or a flower only at the centre and not the background, you will want to set the aperture to a lower number. As you increase the F number, more area surrounding the centre is going to come into focus. Here’s the caveat – since higher aperture number lets less light in, it will also decrease your shutter speed. In situations where you want sharp pictures AND your shutter speed is not fast enough, you will need to set your ISO to a higher number. That would enable you to set the aperture to a higher number while keeping a fast enough shutter speed to obtain a well-exposed photo. This sounds like a lot, but start playing with the Aperture values and you will see the difference. Photography is very hands-on. More you play, more you will see the difference. I hope this encourages you to experiment with the manual settings on your camera a little more. Now it’s your turn to share your photo posts. I always look forward to seeing them. Every photo is special because it suspends a moment and everyone sees the world around us differently! So don’t compare and contrast, just have fun and see the world that only your eyes can see! You can add any number of links to your posts from the previous month. The posts should have photos in them, with a story or anecdote. 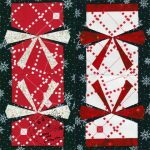 Your project photos (quilting, sewing, painting, knitting, etc.) are most welcome. 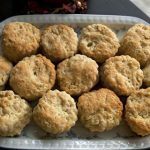 You can also write a new post to link up. Please do not link up posts that are older than the previous month, they will be removed. Spread a little encouragement amongst each other. I will leave the link-up open for two weeks. 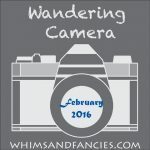 Wandering Camera is a monthly event that will run on the first Thursday of every month. The next post and link-up will be on the 2nd of June. If you follow me via email, bloglovin or facebook, you will get a reminder. I am also linking up on Photo Friday and Fun Friday Favourites along with other linky parties on my sidebar. How do you manage to get each beautiful photo, each day?? They are all lovely. What a pain to be plagued by allergies…..they don’t seem to tarnish your ability to capture gorgeous shots, Soma. 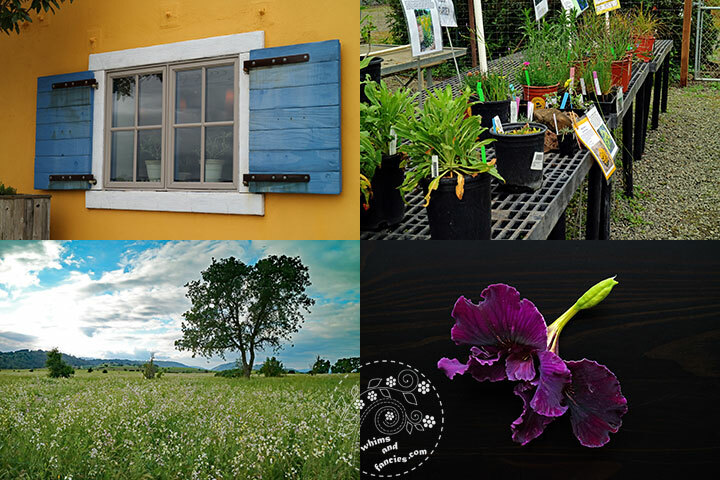 Always love your photo’s Soma…thanks for linking up at Bits’nBobs. I have linked up as Cath@Home with my Tahune Walk. 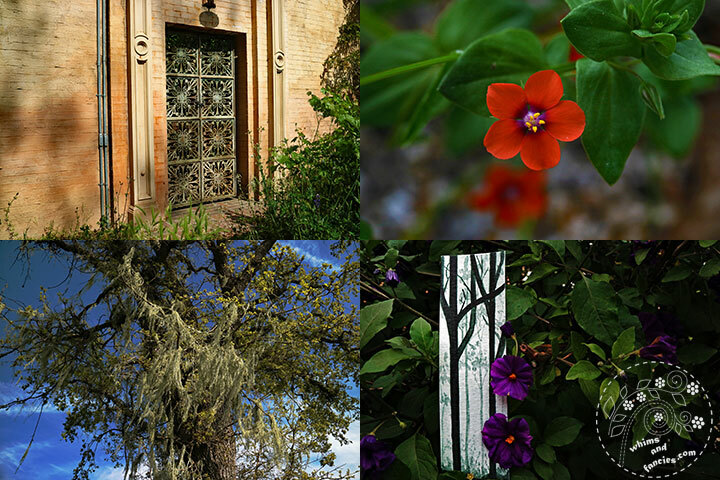 I am completely blown away with your photos, Soma!! They are all simply stunning!! I feel like I have been on a vacation in California, and you have given me the special tour of seeing these beautiful “now moments” through your eyes ! I keep seeing a new favorite… so they must all be my favorite!! I love the peaceful place they take me to!! Thanks for the information on Aperture and ISO. I’ve been playing/practicing but have SO MUCH to learn. Trying to keep it all straight in my head is sometimes trying (! ), but I’m working on it. :) As always, your photos are lovely. Thanks so much for linking to MCM and sharing them. I am not part of any linky party, I just found your blog and wanted to say that your photos are lovely! How fun to view all your lovely photos! 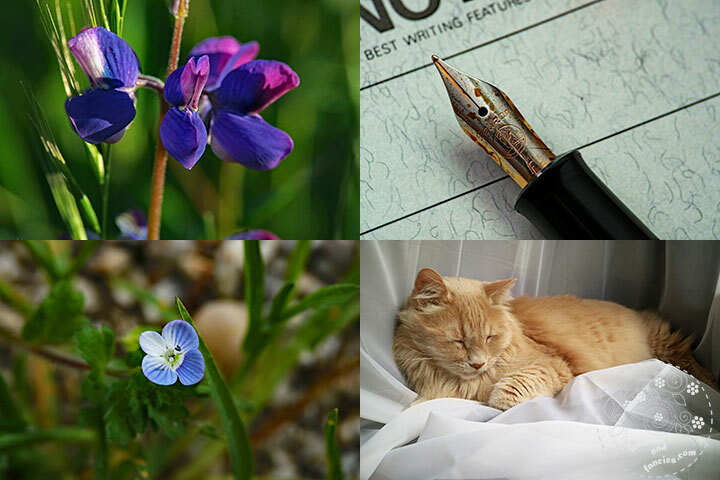 It seemed like a tour of many things I love–kitties, arts/crafts, plants. Such a great collection of pictures. I love all of the architectural shots and well as the cute kitty! Sleepy cat is my fave this month! So fun to see all the great photoes. I’ve linked two posts, and they give you the impression of this time of the year in Norway. Two weeks ago we had snow, and this weekend we had beautiful summer days. 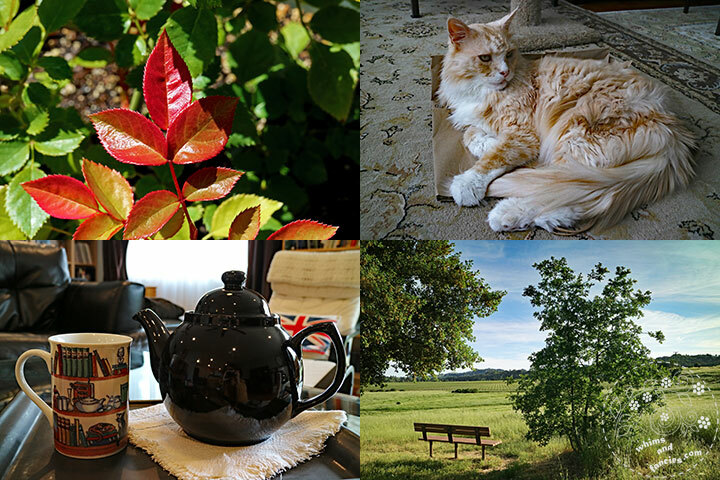 I can’t pick a favourite this month (the blue and yellow building, the flowers, the sky, the cat, the teapot…see what I mean?) Thanks for another thoughtful, informative post; you are definitely prompting me to use my camera in a more sophisticated way. Can’t wait to see what you do with Lara’s applique method! Your photos often make me want to move to California Soma. That park in particular is so beautiful and peaceful. I’m really sorry that your allergy troubles have gotten so bad that it means you don’t get to be outside as often. Hooray for Montague being able to join the family again! And I hope your new Brown Betty brews you many a fine cup of tea. I managed to sneak in a little photography after all. Thank you for the lesson on ISO and aperture. Most of it is so mysterious to me. 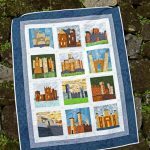 PS – Thank you for the shout out about the Crafted Applique Blog Hop! 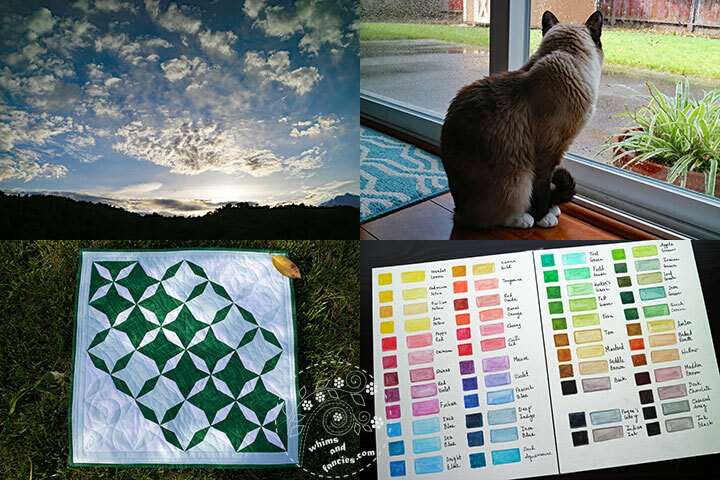 Your second photo – the yellow and blue – I want to make a quilt in those colors! That one just jumped right out at me! Love the photos. Your sky photos are my favorite – they capture such a beautiful view. I pity you and your allergies, I would hate to be forced indoors in the best weather. Lots of camera tips to digest this month. Thanks for the advice and for hosting. Enjoy your week! A wide array of lovely pictures! 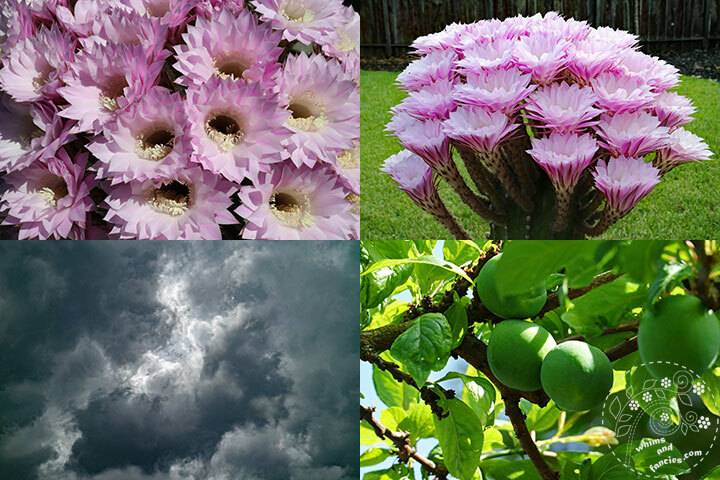 I love the stormy sky and the flowering cactus and the other flowers are so pretty. I can’t believe I don’t own a Brown Betty. They are so glossy, and classy and I bet the tea tastes great. Always a joy to see pics of the kitties, too. I usually end up taking pictures of clouds when I am out walking. Cloud formations fascinate me. I enjoy the kitty shots. I liek the architecture in the river front picture. And, if I had the money, I would buy the abandon building just for the doors. LOL.